If you, someone in your family or someone you know require a Gluten Free diet then this is for you. These gluten free foods can get very expensive and the foods are quite limited. 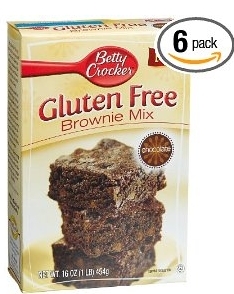 There is a great deal going on at Amazon right now for Betty Crocker Gluten Free products. There are 4 of them to choose from. A brownie mix, cookie mix and 2 cake mixes. All have very good reviews. Here is the great part. They are all 30% off right now. To get this great deal just choose Subscribe & Save to get the first 15% off. Then use coupon code: BETTYCGF at check to get the second 15% off for a total of 30% off. And they ship free with Amazon Prime. Remember, once your items have shipped you can unsubscribe to Subscribe & Save.